One of the big hits at the Geneva Motor show in March was seeing the Italian design house Pininfarina showcase two concepts: the Hybrid Kinetic H600 and Fittipaldi EF7 Vision Gran Turismo. So what makes the EF7 so special? Fittipaldi Motors, the new sports-car company fronted by Brazilian racing driver Emerson Fittipaldi envisioned the Fittipaldi EF7 as their first production model. It will be a limited run two-seated, carbon-fiber supercar powered by a 600-hp, V-8 aspirated engine. A year ago Fittipaldi made major headlines when his native Brazilian law enforcement seized trophies and artifacts from his career in response to alleged bankruptcy. During that time his representative told USA Today that he intended to seek partnerships to solve his financial problems. Wait, back up, who is Emerson Fittipaldi? 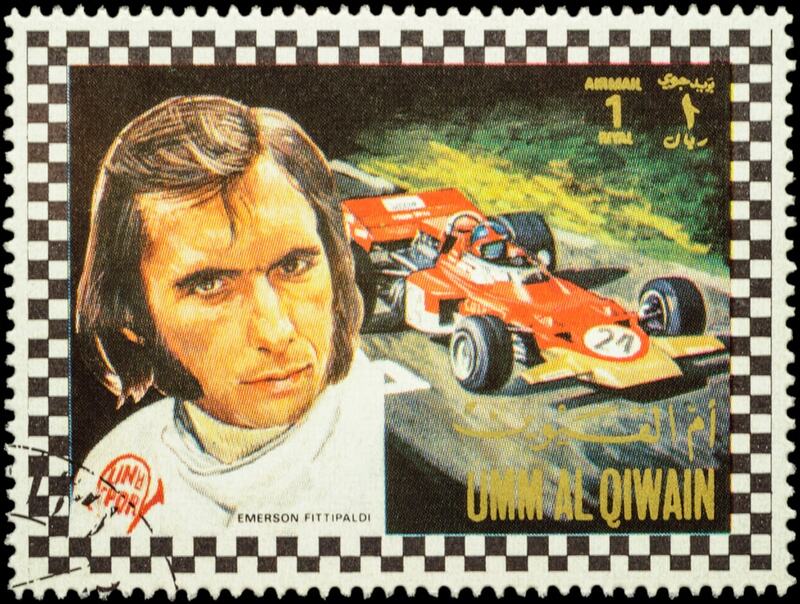 A vintage postage stamp of Emerson Fittipaldi. International racecar driver Emerson Fittipaldi should be famous on just how has accomplished much in his life in comparison to many racers. When he was 25 in 1972 he won five of 12 races with Lotus to become the youngest world champion in Formula 1 history. He then went on to win his second championship for McLaren in 1974, and went on to win the 1989 CART championship and two Indianapolis 500s, in 1989 and 1993 respectively. Notice the common factor? He’s always won driving other people’s hardware. Now with Italian design firm Pininfarina and German engineering company HWA, Emmo is about to get a track car that’s truly his. During the press preview for the Geneva Motor show, Fittipaldi Motors showed off the Fittipaldi EF7 Vision Gran Turismo track car. Sadly, we don’t have many details on it just yet. What we can tell you is that Pininfarina promises that it will follow a traditional race-car formula with an emphasis on high power, low weight, and handeling thanks to a lower center of gravity. Pininfarina reps told the press that the car will weigh about 2200 pounds due to it making extensive use of carbon fiber. They also revealed that the V-8 engine will make more than 600 horsepower, though exact numbers were not given. All the more notable were words “Vision Gran Turismo” at the end of the name. This is no coincidence: the car will be featured in the upcoming installment of Gran Turismo, the Sony PlayStation racing game.